Over the past several months, the stock and bond markets have diverged; this inflection point raises serious concerns regarding the near-term performance of preferred equities. PFF is a very popular preferred equity ETF among investors, and its history based on similar market environments depicts material underperformance. Investors should consider underweighting preferred equities and tactically allocate to other asset classes based on their respective market outlook. Investors also need to be keenly aware of several misconceptions surrounding preferred equity investments. Preferred equities are a popular asset class among investors and provide diversification benefits within an investment portfolio. This investment thesis highlights recent events within the capital markets that translate to a bleak near-term future for preferred equities; hence, the underweight rating. The iShares Preferred and Income Securities ETF (ticker: PFF) is the most popular preferred equity ETF (based on AUM) and will be used as a proxy in this analysis. The focus of this article stems from the macroeconomic environment, as the stock market is near all-time highs yet the 10-year treasury’s yield just materially contracted ~75bps. Though preferred equities may experience sluggish near-term performance, this report provides a few tactical solutions investors can take in order to offset potential underperformance, as well as a discussion highlighting the ideal market environment that would translate to an attractive opportunity for preferred equities. Finally, it concludes with a thorough discussion of common misconceptions related to preferred equities, as other investment commentary too frequently miscategorized (or underestimated) many risks associated with this asset class. Preferred equities are an investment vehicle that falls on the spectrum between a company’s debt and its common equity. Similar to its debt obligation, a company provides a specified distribution payment while the par value of the investment stays constant (generally speaking). Unlike its debt, a company can decide to forgo its preferred equity distributions without actually declaring bankruptcy. If a company decides to temporally suspend its preferred equity distribution payments, only investors that own ‘cumulative’ shares will receive those suspended, accrued payments in arrears. ‘Non-cumulative’ preferred equities do not pay accrued distributions in arrears, should the company reinstate its preferred equity distribution payments accordingly. Since distribution payments are not guaranteed, preferred equities act more like common equities in that the investment return is based on company profitability. However, preferred equities do not benefit from company growth like their common equity counterpart. Again, the principal amount of the investment stays constant while the investment return stems from specified distribution payments. Furthermore, a preferred equity shareholder’s claim to company assets also falls in the middle of the spectrum, as debt investors have priority first, then preferred equity investors, and finally common equity investors. Please note, preferred equities are typically rated by credit agencies (ie. Moody’s and S&P) and have risk profiles similar to high yield bonds. As shown above, PFF is highly concentrated in the financial sector as a majority of companies within this sector issue preferred shares to support growth (and to help manage the balance sheet appropriately). Since preferred equities are correlated to the common stock of companies (because its coupon payments are based on company profits), a negative outlook on the financial sector can have detrimental consequences for PFF shareholders. For example, during the financial crisis of 2008, PFF’s share price dropped from a peak of ~$50/share to a trough of ~$20/share – or a price return of -60%. Therefore, PFF shareholders need to keep a keen eye on the current and future status of the financial sector. There are a few items to note based on PFF’s top 20 holdings. First, credit quality is quite low, especially considering that the top 20 holdings (out of 456) account for approximately 25% of the portfolio. Also, many of the securities have embedded call options that could negatively impact the portfolio should the issuing companies call back these shares at a discount to the current market price. The reason the convertible securities trade at such a premium to the liquidation price is because of the corresponding (current) stock price at which these securities convert. Finally, the chart highlights the fact that PFF has a significant allocation to preferred equity securities that are non-cumulative. During this timeframe, the 10-year treasury yield increased from 1.35% to 2.50%. As shown above, PFF’s sensitivity to duration outweighed its correlation to the stock market, as its share price dramatically declined, offsetting any returns from distribution payments. On a relative basis, the preferred equity asset class significantly underperformed the general stock market, as well. The chart above highlights PFF’s correlation to the stock market, and subsequent negative returns that accompany market pullbacks. In just one quarter, PFF’s share price declined enough to wipe away one year’s worth of distribution payments. Luckily for investors, PFF and the stock market both rebounded in Q1 of 2019. During the first two quarters of 2015, the S&P 500, 10-year treasury yields, and PFF all traded within a tight range. Since PFF offers a substantially higher distribution yield, it outperformed both markets during this stagnant timeframe. As highlighted above, two of the three scenarios that can likely occur from this current stock and bond market inflection point highlight a bleak outlook for preferred equities in the short-term. The stagnation scenario would suggest an equal-weight (or even overweight) allocation to preferred equities, though this scenario seems unlikely based on the material divergence between the two markets and the expected volatility that will ensue. Since preferred equities are presented as an underweighted asset class, the likely asset class to overweight is short-duration bond funds. As has been overly reported, the yield curve is flat and even inverted at certain points. Therefore, assuming duration risk is inadvisable unless investors expect a recession very soon and for the yield curve to invert drastically. Remaining on the short-end gives investors a 2.5%+ distribution rate without price volatility, thereby providing investors the opportunity to earn a decent yield while more attractive opportunities present themselves. For example, should PFF pullback due to an accompanying pullback in the stock market, or because long-term treasury yields shoot upwards, then investors can buy back at a more attractive entry point after remaining on the sideline. Occasionally, investment professionals publish reports that categorize preferred equities as low risk. This is a misconception based on the shareholder’s claim to company assets. Sure, preferred equity shareholders are entitled to dividends before common equity shareholders, but the investment itself is highly correlated to the company’s stock price. In fact, from a total return perspective, preferred equities suffer from no upside yet capture all the downside should the company go bankrupt (or trend towards bankruptcy). Preferred equities are a valuable asset class within a diversified portfolio; however, they should not be considered “low risk”. Another misconception is that its dividends are “safe”. In fact, the opposite is true. Preferred equity owners are only paid dividends if there is cash available after servicing debt payments and operational expenses. If the underlying company is struggling financially, then it can terminate preferred equity distribution payments without actually going into bankruptcy. Therefore, preferred equity dividends should not be considered “safe”; instead, investing in a company’s bonds would be considered much safer. And to take it one step further, any preferred equity investors that own non-cumulative shares will not accrue lost dividends should the company temporarily suspend payments during a financial restructure. In either case, the price of the preferred share would substantially decline should payments cease (either permanently or temporarily), which does not translate to a “safe” investment. Preferred equities’ correlation to other asset classes (specifically, equities and bonds) sometimes is miscategorized as uncorrelated. As previously highlighted, this is incorrect. Correlation might be low relative to bonds and equities, but they are still correlated, nonetheless. Preferred equities will see material price movement during stock market volatility, as evident based on the 4Q18 stock market pullback and subsequent rebound during 1Q19. During Q4 of 2018, PFF’s price declined from $37.94 to $34.23, a price-only loss of ~10%. Though this is less than the overall market, PFF should still be considered correlated to common equities. 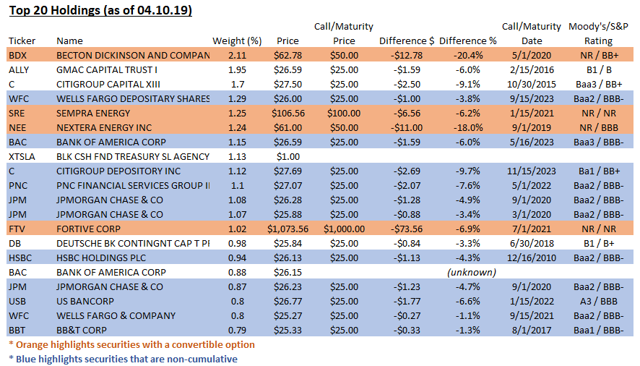 If the market did not rebound during Q1 of 2019, it might have taken investors two years’ worth of dividends to recoup those losses (assuming the underlying companies continue paying its preferred dividends). Furthermore, preferred equities are highly correlated to non-investment grade bonds, as shown in the chart below. Therefore, investors need to be keenly aware of misconceptions regarding preferred equities and correlations to other asset classes. The embedded call option feature associated with preferred equities allows the issuing company to call back the preferred stock, many at a sizeable discount to its market price. Investors in PFF (and other preferred equities with callable features) need to be keenly aware of this potential impact. Furthermore, there are several preferred securities highlighted in the table that are non-cumulative, meaning the company does not need to pay accrued dividends to shareholders should it suspend payments for any specified period of time. As opposed to bond investors, this feature increases risk associated with preferred equity investments, and should not be considered a perpetual investment. Since the investment thesis recommends underweighting preferred equities, the primary risk stems from economic stagnation. As highlighted above, should the stock and bond market trade in a flat range over the near-term, then preferred equities will outperform these asset classes, and potentially others. Under this scenario, the price of the underlying securities should remain relatively constant and investors can enjoy a healthy dividend materially greater than the stock market and investment grade bonds. However, recent events in both markets would suggest that this risk is low and that further volatility seems likely. 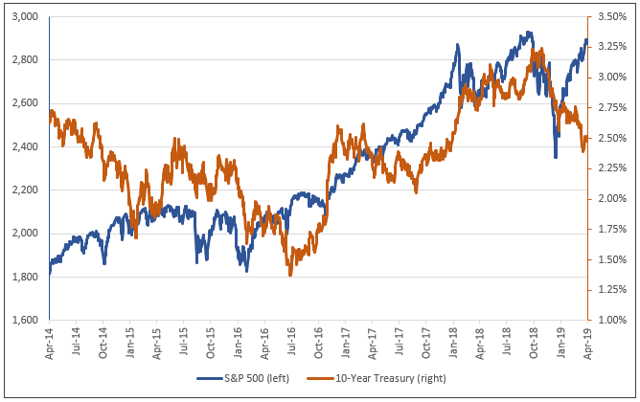 The goal of this investment thesis is to highlight the fact that preferred equity investors are currently at a material inflection point, where the stock market is near all-time highs, yet long-term treasury yields significantly contracted from its recent highs. Both markets seem to be signaling opposite messages. Therefore, if either market were to correct, preferred equity investors will likely experience near-term underperformance. The short-term risk/reward profile does not look attractive and devout preferred equity investors should consider scaling back and re-entering at a more attractive valuation. Additional disclosure: The information presented is based upon sources and data believed to be accurate and reliable.